DALLAS (CNS) — Even after becoming the toast of the sports world, golfer Jordan Spieth, a 21-year-old Dallas Jesuit graduate, remained humble and down-to-earth as he worked the crowds at Augusta, handled the media, and bantered with morning and late night talk show hosts after his historic win. 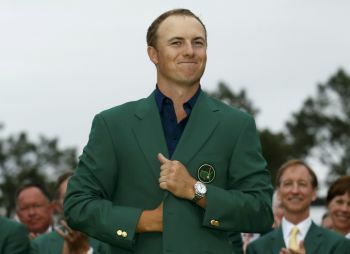 That’s no surprise to those who know the new Masters champion, who set course records at Augusta, Georgia, from April 9-12 on his way to the coveted prize and the iconic green blazer. They say he has kept family first, especially his younger sister, Ellie, who is autistic. Michael Earsing, the president of the Jesuit school, said that the foundation of family, balance and caring for others has no doubt created a different perspective for Spieth, one that will serve him well after winning the Masters. At the Masters, Spieth became the second-youngest player to win and was the first to reach 19 under par in the tournament. His 28 birdies in the four rounds at the Masters is a tournament record. He also logged the best scores after 36 and 54 holes. And if that were not enough, he is only the fifth player in tournament history to lead from start to finish. He finished 18-under par, 270. Spieth is now ranked as the second-best golfer in the world behind Rory McIlroy, and is watching his already rising status accelerate significantly. Spieth’s win at the Masters has inspired the Dallas Jesuit community, but perhaps none more so than the school’s golf team, which was preparing for a regional tournament during the Masters tournament. Jesuit golfer Cameron Suhy said the team members were constantly checking their phones to get the latest on Spieth, who only four years ago was in their shoes playing golf for Jesuit. During his time at Jesuit, Spieth led the team to three Class 5A state titles in the University Interscholastic League. Jesuit golf coach Cathy Marino, herself a 10-year veteran of the LPGA, said while Spieth definitely stood out on the golf course, he was just a normal teenager. For Spieth, the Masters win brought him a paycheck of $1.8 million. He already has an endorsement deal with Under Armour and there is talk that other lucrative endorsement deals are in the works. He was on various morning shows and late night shows April 13 and April 14. Unlike other Masters champions who take the week off following the tournament, Spieth said that he would play the RBC Heritage in Hilton Head, South Carolina, April 16-19 because he wanted to give back to the tournament that was good to him when he turned pro. That loyalty is not surprising for those who see Spieth on the national stage. They say he is the same young man with the same value system that he had embraced at Dallas Catholic schools, including his elementary school, St. Monica Catholic School. And Jesuit’s Earsing said Spieth will be an inspiration for students, parents and teachers in Dallas Catholic schools. Gonzales is a staffer writer for The Texas Catholic, newspaper of the Diocese of Dallas. Texas Catholic staff writer Cathy Harasta contributed to this report. Via live TV cablecasts received here in northern Vermont last weekend (in the Diocese of Burlington), I watched Mr. Jordan Spieth and his player colleagues at the Masters tournament at Augusta National Golf Club. His wire-to-wire dominance of the field and victory at a score of 270 were impressive, but so was his matter-of-fact demeanor after nearly every stroke he made. And after the fact now, from this article “Masters Champion…” by Mr. Seth Gonzales of CNS and with Ms. Cathy Harasta contributing to the report, I find out he is Catholic to boot, formed academically, physically and spiritually in the Jesuit tradition. Obviously this young man as a whole human person can serve well as role model for other young athletes to emulate, as in collegiate conferences. But there is a broader context for the meaning of his appearance on the national and world stage that helps to fill out the concept of “balance” mentioned in the article. That is the context of the nuclear family. In this vein, his own parents greeted him at his victorious 72nd hole of the four-round event, and the TV commentators had let us know that in spirit his sister Ellie, a disabled person who is autistic within the ASD, was there, too, to compose and ground his mind in love even though she could not make it to Augusta on Sunday. In this broader context then which captures the moral notions of the strong helping the weak and the weak honoring the strong, can one argue that Mr. Spieth and others like him has and have a part to play in the New Evangelization of the Catholic Church with its aim of bringing invisible members out from enclosed church pews to the visible front lines of secular society to show what faith, hope and love can do to complement reason and thus improve one’s grasp on what reality truly is, and then to make certain and correct judgments on what to decide to do and how to behave? It seems so. For example, it would not seem outside the bounds of reason to suppose that the evolving story of Mr. Jordan Spieth and his family might rightfully have a place somewhere in the program, such as on the theme of family as agent for the New Evangelization, for the upcoming 8th World Meeting of Families Congress in Philadelphia this September when our Holy Father, Pope Francis, is scheduled to visit the City of Brotherly Love.